Making live performance, as Robert Lepage once said, is all about meeting people. Things only begin to happen in the moment of creative encounter, where there’s a connection or a collision of different artistic, intellectual or corporeal energies. Collaboration has always been a prominent feature of choreographer Tess de Quincey’s work. Think of the ambitious sprawl of DeQuincey/Lynch’s Compression 100 (1996), a collaboration with a host of Sydney-based musicians, writers and visual artists, or her work with visual artist Debra Petrovitch, poet/performer Amanda Stewart and media artist Francesca da Rimini in Nerve 9 (2001). More recently there was Moondance (2015) in which she worked with both a photographer and a video artist. In her latest project, a double bill titled MetaData, collaboration is again at the fore as she works with a team of video, sound and animation artists, deploying techniques of data visualisation in a shadowy meditation on the relationship between science and art. The first piece, Pure Light, is described as an homage to American artist Dan Flavin, best known for his minimalist installations of the 1960s and 1970s. Images of large fluorescent tubes are projected onto a screen at the back of the stage to create a series of shrine-like frames for an enigmatic solo figure dressed all in white. Later, the space is suffused with colour: gradated orange through to peach, garish apricot and hot pink. The figure seems to diminish, but her shadow looms large on the screen and draws focus, cutting through the colour. It’s a short work which shuttles easily between the playful and the sinister. Using the images of fluorescent tubes as a way of lighting the stage is a fun irony, but it also creates some spooky effects on the creeping figure. As the figure, de Quincey is a compelling dramatic presence. Her movements are slow, forced and slightly tremulous, as though she were subject to unwilling possession. The moment when she turns to face the audience for the first time is a breathtaking reveal. Against a dark background, with her pale skin, spiky white hair, white eyebrows and large white hood, she seems a profoundly mournful vision. The second piece, Moths & Mathematics, which de Quincey dances with Peter Fraser, is more challenging. Again, the dancers perform before a screen. Flickering points of projected light slide across their bodies as they pace back and forth, tracing a grid pattern on the stage floor. Gradually the animation develops in complexity with long curving lines and small star bursts. Shapes and patterns emerge that move with the sound design, as if responding to frequency data. There are long twisting particle streams and thickets of saw-toothed waveforms; three-dimensional bar charts rise up like brutalist apartment blocks, each with hundreds of pulsing cells. All the animation is beautifully detailed, but by the end we lose sight of the dancers. In discussing Nerve 9, which also used frontal projection, de Quincey once suggested that it was the fact that the body kept getting in the way and fragmenting the projected images which—paradoxically—held the work together. In Moths & Mathematics, Fraser and de Quincey seem too small to influence our perception of the animation, which towers over them and is in any case already fragmented and abstract. Often it’s like they’re huddling, limbs folded together, disappearing into one another beneath a squall of data. Over at Chunky Move, as part of the 2016 Next Move program, contemporary dance maker and performer Melanie Lane and former Australian Ballet soloist Juliet Burnett engage in what looks like a more traditional collaborative relationship: the choreographer and her star dancer. At its core, Lane’s piece, called Re-make, places us at an intersection between one dancer’s embodied knowledge of ballet traditions and another’s contemporary desire to pull apart classical forms and refashion them after a futuristic contemporary dance aesthetic. It begins with five variations on a short but beautiful balletic study en pointe danced by Burnett—in gold-brown body suit and gold lipstick. Lane, all in black, watches from the sidelines. At first the mood is one of cool reserve with an emphasis on poise and control; but with each successive repetition Burnett becomes more and more expressive. At the same time, the lighting becomes more atmospheric and the musical accompaniment more affecting. This progress toward expressivity culminates in a whirlwind tour through the various bits of mime and prop work in the ballet Giselle. We get Giselle and her mirror, Albrecht and his sword, Bathilde and her goblet, and plenty more. We also get their deaths. Soon after this, Lane joins Burnett on the floor and attempts to wrestle her in a new direction, away from romantic storytelling toward a sort of arty expressionism with gothic overtones. And so it is that Re-make eventually finishes with a heaving half-lit pas de trois between Lane, Burnett and a hefty black Kubrick-esque monolith. In one memorable passage on the journey toward that point, Lane pulls a long black tutu over Burnett’s head. With Burnett doubled over, all we see are her long legs surrounded by a mass of tulle. 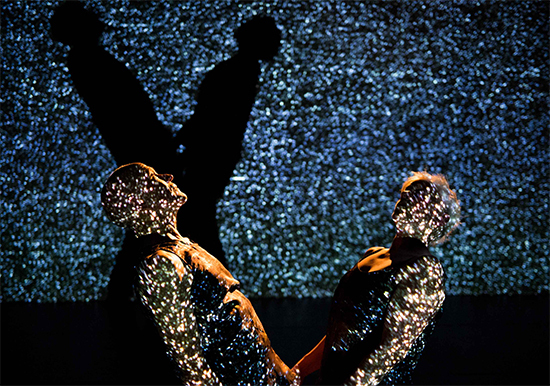 It’s an image reminiscent of Xavier Le Roi’s Self Unfinished (1998), performed in Australia in 2015), but more theatrical. She begins to move laterally, again en pointe, fluttering around the stage on swift little steps. It’s like the remnants of a torso-less statue come to life. Is this the long pas de bourrée of The Dying Swan, seen from below? This is ballet as radical subtraction: Fokine’s sentimental mime without the expressive arm movements on which so much of the sentiment depends. The question then shifts to one of substitution. Not all sections are so original. A kind of intermission where Burnett, with a few glam rock accessories, strums awkwardly on an electric guitar is superfluous, and I wonder if the wrestling isn’t a little too obvious, even though it does generate some interesting hybrid shapes. They’re a well-matched pair, Burnett and Lane, despite their different dance backgrounds, with both artists seemingly at home in uncanny nightscapes. Burnett may have danced La Sylphide while at Australian Ballet, but she also thrilled to the alien lines of Wayne McGregor’s Chroma (2006). In Re-make she displays almost entomic sangfroid, relishing the metamorphosis of ballerina into praying mantis. In Mermermer, the second work on the program, collaboration centres on a meeting of artistic philosophies. Jo Lloyd and Nicola Gunn have been collaborating on and off for several years now, with Lloyd providing choreography for Gunn and Gunn dramaturging for Lloyd. Here they are sharing creative responsibilities in what feels like a real vanguard piece, extending the old maps and testing the ground for new ways forward. Mermermer is billed as a conversation between the last two surviving humans about the process of making art. This set-up, however, is not referred to in the performance itself; instead, choreography becomes a way of cataloguing or structuring past affective experiences. Remembered bodily reactions become brief dance phrases which, when strung together, draw the two dancers round and round the stage. It’s all held together with a bouncing, vigorous back-and-forth rhythm, an energy characteristic of Lloyd’s work. After some 15 minutes, Gunn abruptly leaves the stage to fetch something which she calls “the view.” This turns out to be two large grey ponchos and piles of shiny streamers. There is an extended moment of stillness as the two performers pose beneath their props, and then the murmured talk resumes, but less concentratedly, with meandering anecdotes and more conversational interaction. Both artists have in the past made plenty of art that reflects on the process of making art, but here the composition is more random or fragmented, like a collage of memories. In their program note, they force an imaginative link—via a quote from American author David Shields’ book Reality Hunger: A Manifesto (2010)—between the word memoir the French la mer, “the sea.” And Mermermer, particularly in its last section where the conversation falls away completely, does have a soothing effect reminiscent of the mimic motion and medleyed sound of a calm ocean. If it isn’t dance enough for dance or theatre enough for theatre, perhaps it is, after all, no more than a meeting. In one of her many digressions, Nicola Gunn describes an idea for a new performance piece in which a group of bald men with straggly beards arranges chairs and tables on a stage as if in preparation for a meeting. When the room is finally ready, a woman draws the stage curtain and explains to the audience, in French, that the meeting is a private one. Ah, well, sometimes art is like that: not everyone is invited and not everyone speaks the language. Chunky Move’s Next Move commission seems like an appropriate platform for work that is—at least in part—a conversation in petto about the future of performance, one which may later develop into something more engaged and engaging.